Circulation is crucial in various pool care processes. No matter how hard you try to keep chemical levels balanced, chances are you’d still run into problems if water is not circulated well. Proper pool water circulation helps distribute chemicals evenly. It’s also necessary in keeping the pool water crystal clear. The pump takes in water from your pool and delivers it to the filter. Water passing through the filter, in turn, is cleaned. Once filtered, the water goes back to your pool through the return jets. It helps if the return jet is multidirectional so water can be pushed downward. Once water is pushed downward, against the direction of the skimmer, pool water at the bottom and at the surface is properly stirred. 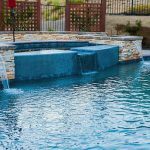 Another way you can enhance pool water circulation is bi directing jets at the dead areas in the pool. Dead pool areas include the bottom of the ladders, crevices, and steps. Water is circulated poorly in these areas making them more prone to algae buildup. To remedy this, you can manually brush the areas. This will help break down debris so they’d find their way into the water, and eventually into the filter. Make it a habit to brush your pool at least once a week. Also, run the pump regularly to ensure that the water quality stays safe for use. Complete circulation of the pool water. You may need to run your filter longer, depending how busy your pool is. Note that even human sweat, makeup, and lotion can contribute to pool water contaminants. 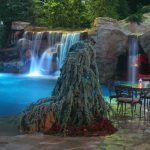 Check out this post on how long you should run your pool pump. Don’t forget to as well clean your filter regularly so you can prevent clogs, and so it can perform its job well.